As any president or CEO can confirm, keeping staff engaged, motivated and inspired is a tricky thing. It’s something to which I pay particular attention in my role at Shaw Centre and I’m proud to say that as a team we feel we’re doing a pretty good job in this area. 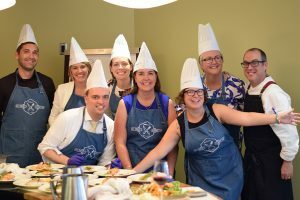 I’m also proud of the role that Shaw Centre plays in helping other organizations create and deliver effective teambuilding activities for their staff. As the excitement of 2017 winds down, clients are preparing for key initiatives in 2018 and many of them will be visiting Shaw Centre for a wide range of inspiring events. Chef Turcot with a Culinary Clash team. A new program developed and launched this year is proving to be one of our most popular offerings. Executive Chef Patrick Turcot’s Culinary Clash sees teams pitted against each other to weave some competitive culinary magic in our state-of-the-art crEATe kitchen. Working with top of the line equipment and many locally-sourced ingredients, Culinary Clash offers a unique teambuilding opportunity where team members work together to perform precise tasks while racing against the clock. The best part: when the work is done, everyone gets to relax and enjoy an outstanding meal with fantastic wine pairings. crEATe kitchen’s versatility provides several other options for culinary-focused events, ideal for teambuilding, celebratory and client recognition purposes. We’d be delighted to work with you to come up with a delicious event! The unique design of the Shaw Centre facility means we have flexible event spaces suitable for groups both large and small. Frequently, as part of a large convention, groups participate in teambuilding activities in breakout areas, including on the west side of the building overlooking Ottawa’s scenic downtown core. Among the many memorable extracurricular events our clients have enjoyed are yoga sessions in the Trillium ballroom, scavenger hunts throughout the Centre, and catered lunch and learn gatherings. The Grey Cup Festival’s Grid Iron Gals. Recently, Shaw Centre was honoured to host many different activities as part of the Grey Cup Festival. 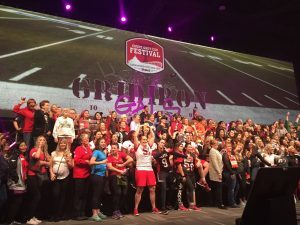 One of the most unique elements was the Gridiron Gals event, which saw our space transformed into an interactive zone which included an obstacle course, intense football drills and other exciting activities. As always, we welcomed the inclusion of outside vendors to enhance the experience; the onsite mini-manicures and nail bar offered by The Ten Spot were the perfect complement. Whether your sessions include corporate training, employee rejuvenation, goal setting or personal development, the flexibility of our spaces and the experience of our team ensure we can help make your vision come to life. At Shaw Centre, we are always open to new ideas and possibilities and would be honoured and excited to work with you to create a most effective, unforgettable team building event.